Cyber attacks will have a similar global impact to water crises this year and are nearly as likely as natural disasters, the World Economic Forum (WEF) has warned in an analysis of societal risks that underscores that critical importance of effective cybersecurity protection. Based on the opinions of nearly 1000 global decision-makers, the WEF Global Risks Report 2019 also flagged quantum computing and “emotionally responsive” artificial intelligence as key disruptors but flagged cybersecurity risk as a major and likely issue for already-struggling economies around the world. 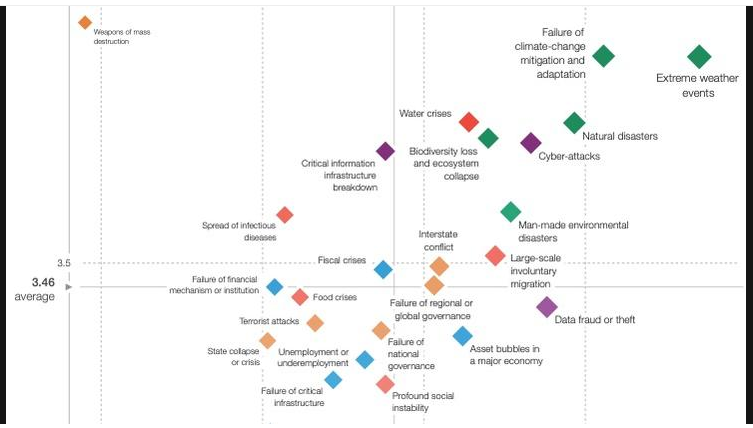 Only extreme weather events, natural disasters, water crises, weapons of mass destruction, biodiversity loss and the failure of climate-change mitigation were deemed more impactful, while data fraud or theft was only slightly more likely than cyber attacks but somewhat less impactful. Cyber attacks were linked to trends such as increasing national sentiment, the increasing polarisation of societies, shifting power, and rising income and wealth disparity. They were connected to a range of risks including the failure of critical infrastructure, critical information infrastructure breakdown, terrorist attacks, profound social instability, interstate conflict, failure of national governance, and the adverse consequences of technological advances. Amongst those surveyed, cyber risk was widely identified as a significant subset of this challenge. Fully 82 percent expected 2019 would see increased risk around the theft of money and data – the fifth highest out of 42 areas of concern – while 80 percent anticipated disruption of operations and infrastructure due to cyber attacks. “The potential vulnerability of critical technological infrastructure has increasingly become a national security concern,” the report’s authors note. Around 60 percent of respondents expect this year will see increasing loss of privacy to companies and governments, while 69 percent anticipate the risk of fake news. Identity theft was also high on the list, with 64 percent expecting it to increase this year, while the rest of the list was dominated by broader sociocultural and political issues. “Given the near daily headline-grabbing data breaches and widespread fears of nation-state attacks, these findings should come as no surprise,” said Tenable co-founder and chief technology officer Renaud Deraison in a statement. That impact was continuing to loom large in consideration of other key risks: cyber risk was positioned in the context of ‘global commons’ alongside issues such as climate change, outer-space policy and management of Earth’s polar regions. “In the context of rising geopolitical competition and weakening multilateral institutions, debates revolving around these pressures have the potential to be destabilizing and even to foment conflict,” the report notes.